Automated handpiece maintenance units that clean and lubricate handpieces not only save time and money in the dental practice, but selecting the correct unit will ensure you comply with the mandated hygiene protocols. Automated handpiece maintenance units are recommended under the ADA’s infection control guidelines as they help avoid over-oiling handpieces, which can interfere with the sterilisation process. The ADA also recommends the use of an effective detergent to clean instruments prior to sterilisation. Only one brand of unit—the W&H Assistina—is able to do that. All other automated handpiece units sold in Australia lubricate only, requiring cleaning of handpieces by hand. Automated handpiece units such as those produced by W&H also increase the reliability and greatly extend the service life of turbines and handpieces. Only the W&H Assistina has a proven process of cleaning and lubricating handpieces, including drying air and water passages. The use of the slightly alkaline W&H ActiveFluid provides optimum cleaning by more effectively removing blood, fats and proteins and for reducing surface tension to allow ingress to the narrow lumen. The pH balance of W&H ActiveFluid also helps prevent corrosion of metals, ensuring handpieces last and stay better-looking longer. Another area where Assistina automated handpiece units stand out is in having the lowest operating costs of any units available on the Australian market. Optimum ﬂuid usage = savings! The Assistina cleans and lubricates handpieces for as little as 3 cents to just 8 cents per handpiece. How does your current cleaning and lubrication protocol compare? Operating costs of competing handpiece lubrication units are generally more expensive than the equivalent W&H Assistina, ranging from 5 cents to 12 cents for “Lubrication” only of handpieces. This figure does NOT include proprietary ﬁlters which can be expensive and adds to operating costs—and does not provide the beneﬁt of a detergent to provide proper cleaning of instruments prior to sterilisation. 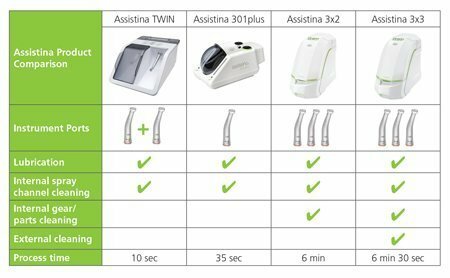 Whichever Assistina unit you choose for your practice, you have the conﬁdence of maintaining infection control protocols and saving time and money whether you work in a small or large practice. W&H Assistina is available from Ivoclar Vivadent throughout Australia. For more information on W&H Assistina, contact Ivoclar Vivadent on 1300 486 252 or orders.au@ivoclarvivadent.com.au.